Please fill in the short form below with your question, either about the Simrad EK15 Scientific, or for some technical advice. Please include details of your vessel if you feel they will help us answer your query. The Simrad EK15 is a multi purpose scientific echosounder designed for a variety of applications, and for both mobile surveys and fixed locations. The EK15 can be used in a wide variety of environments: lakes, fjords, harbours, shallow marine, rivers, and even in aquaculture fish cages. 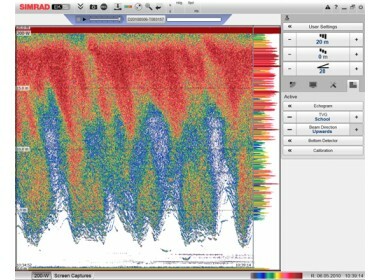 The unique functionality offered using numerous transceivers, raw data logging and interfaces to secondary systems allow you to use the EK15 for fish stock assessment, studies of fish behavior and fish-plankton interactions, habitat mapping and ecosystem monitoring. The Simrad EK15 is based on a small and ruggedized single beam Transceiver Unit and a dedicated transducer. The operational frequency is 200 kHz, which offers a very high resolution and high accuracy. You can use the Simrad EK15 with up to 15 Transceiver Units. These will operate in parallel with either simultaneous or sequential pinging. Using multiple transceivers you can monitor large areas with only a single echo sounder system. 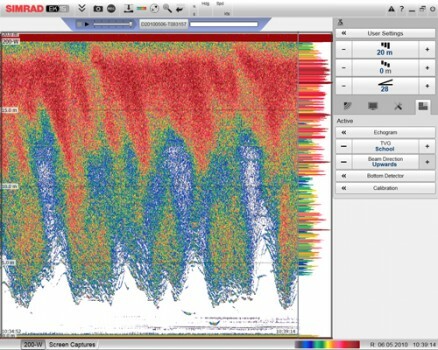 Due to the fact that the echogram presentation on the Simrad EK15 can be turned “upside down”, the sounder is the ideal solution if you need to monitor a large number of fish cages. One transducer can then be placed at the bottom of each fish cage looking up. You can also set up a custom EK15 system to create an “acoustic fence”. Such “fences” are in frequent use to monitor the water inlets in a hydropower dam. A similar system can be used across a river or a fjord if you research fish migration, or simply needs to check the habitat and the occurrence of marine life. You can also set up the Simrad EK15 for wireless communication between the computer and the Transceiver Units. This is a good solution for both portable and fixed installation systems as the amount of cabling is greatly reduced. To control the EK15 operation you can use a standard commercial computer, even a laptop. The EK15 application supports Windows 7 operating system. On a larger system with multiple transceivers we recommend using a large display in order to the view all echograms simultaneously. You can connect up to 15 transceivers to the computer by means of a commercial Ethernet switch. If you only need one transceiver, the switch is not required. Each transceiver is provided with a dedicated power supply for AC operation. The only communication between the transceivers and the Ethernet switch (or computer) is the Ethernet cable. Due to the amount of information, only high quality Ethernet cables can be used. The cables may be easily replaced by commercial wireless systems.